Hiroshi Imai, President of Imai Kigyojo K.K. 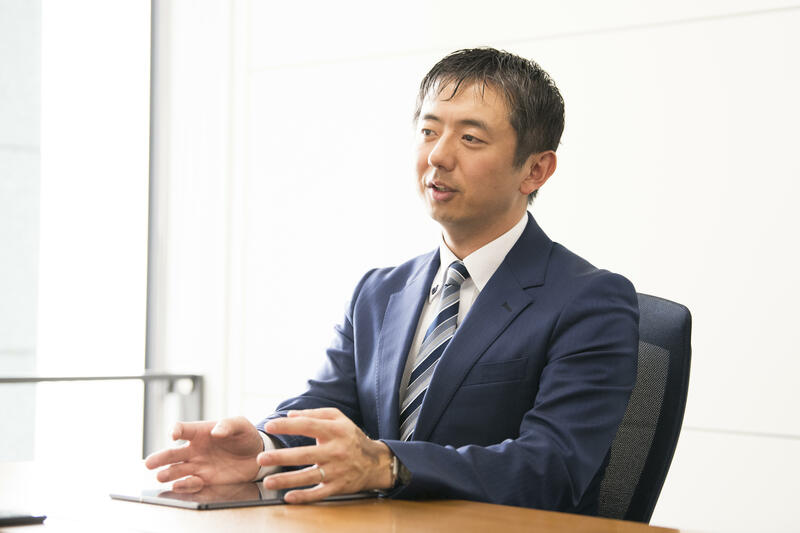 Hiroshi Imai, President of Imai Kigyojo K.K., a Toyama-based company engaged in the development and manufacture of warp knit fabrics, talks about his passion and devotion to product development and his endeavors to differentiate the company. 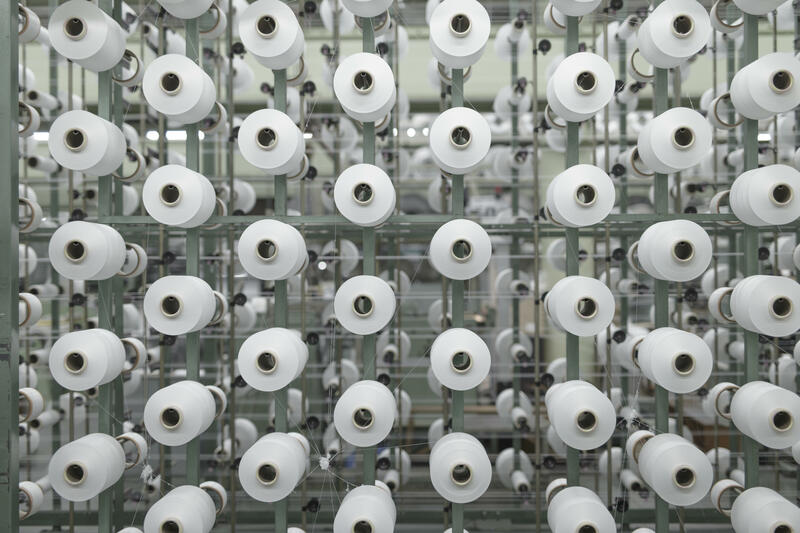 Hybrid materials with a combination of knitted and woven fabrics to maximize the performance benefits of each textile We produce a type of knit fabric called warp knit ("tate-ami" in Japanese). Using fibers that are thinner than a hair, warp knit fabric, which is also known as tricot, has a range of functions depending on the combination of yarns used. Warp knit fabrics are characterized by their elasticity, lightweight comfort and softness. They are used in a wide variety of applications, ranging from fashion apparel such as sportswear, underwear and uniforms, to - more recently - vehicle materials and sanitary supplies. Currently, we are focusing particularly on the manufacturing method using a special device called a weft insertion machine. By inserting weft yarns into knitted fabric as if weaving a textile, we can combine the performance benefits of both knitted and woven fabrics. Cotton, linen and silk, all of which used to be difficult to handle as warp knitting material, can now be readily used with this weft insertion technology. 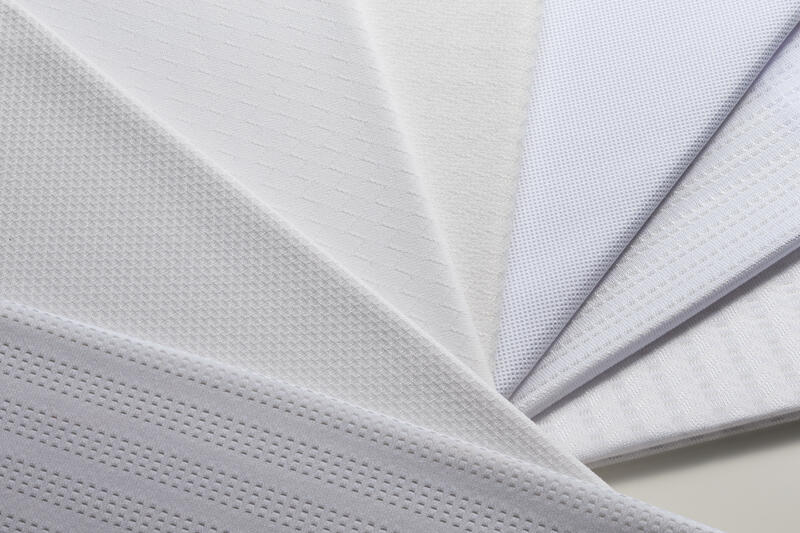 The more choices of materials we have, the more combinations of performance benefits we can access, which helps us to differentiate our products from ordinary tricot fabrics. Because the operation of a weft insertion machine requires advanced techniques, there are few operators in the country. 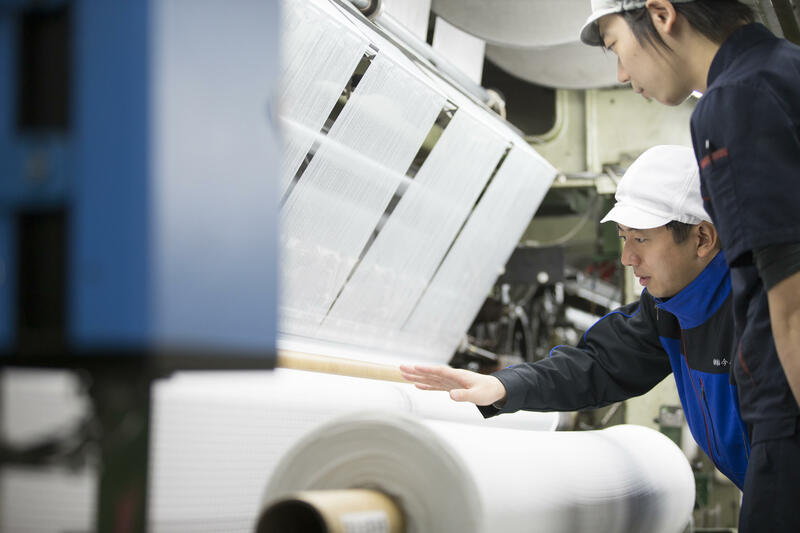 With approximately 60 percent of the total number of weft insertion machines installed in Japan, we hold the leading market share. I believe that the key to the future of manufacturing is "differentiation." For this weft insertion technology to give us a huge advantage, we launched a brand called "Tricot Next" three years ago, for which we have registered the trademark and obtained a patent. Strong emotion toward Bemberg inherited from my predecessor To survive in the textile industry in this challenging era, the development of new technologies and products is indispensable. Bemberg, with unique properties that differ from those of other materials, is one of our major pillars in manufacturing, along with weft insertion technology. We have a long history of working with Bemberg since the era of the former president, who was my grandfather. My grandfather had a strong affection for and devotion to Bemberg. He sought to develop a soft, comfortable fabric by using only Bemberg as the main material, with no synthetic fiber blended with it, which would then be combined with Roica. Many trials and tribulations finally led him to develop what he had dreamed of. He then desperately visited every related company to make sales pitches and present the samples he had created. Unfortunately, his fabric was not commercialized, but this story tells me how passionate he was about Bemberg. By the mid-1960s, tricot made of 100% Bemberg became a dominant material in women's underwear, achieving such success that production was unable to keep up, and more than half of the machines at our factory had to run at full speed. In the mid-1970s, synthetic leather using Bemberg on the base became an explosive hit. In the late 1980s, we leveraged the excellent water absorbency of Bemberg to develop a towel designed exclusively for morning shampooing, or "asa-shan," a trendy ritual among the young at that time, which achieved another home run. All these items have ceased to be produced over time, but Bemberg is certainly a critical part of our long history. Every time I talk to old employees who are familiar with those days, I can sense their strong commitment to manufacturing and Bemberg. As a result, when I am involved in development with Bemberg, I also feel strong emotions toward it. Commitment to lead the company by participating personally in development and sales activities We develop and manufacture products based on ideas and requests from customers. We focus on many of our products as niche items but not the whole market, targeting somewhat specific customers and applications. Regardless of their field, we are fortunate in that our customers have an innovation mindset, a strong passion for manufacturing and a desire to make something "different" rather than "affordable," and so we have been able to continue to work on the development together. When I became president, I often felt that in terms of development and production, our contribution to customers was smaller than that of our competitors in the same industry, and I tried to figure out how I could lead the company in a better direction. I then decided to focus on product development and sales. With myself taking the lead, we sought to develop materials that could not be easily made by other companies in order to build up our credit, and we took these technologies and products to customers in sales pitches. At the beginning, there were objections from within the company to these new initiatives. However, as we continued to take on challenges and strive to address issues through trial and error, several small hit products were revealed. The internal atmosphere then gradually became supportive, and voluntary awareness eventually burgeoned. Trust was built with external partners. By accumulating these efforts, we have gradually established a network of customers, processing plants and yarn makers, which has led to our business as it is today. Determination to continuously create new things I think that the performance of the company is dependent on whether the front-line workers can take the initiative in a work environment. Accordingly, since becoming president, I have also focused on improving the work environment for employees, who support our company, as well as developing technologies. First, I have made information on the production and quality situation available to employees wherever possible so that front-line workers can think and act on their own initiative. I also make sure that I communicate to them how the products they have made are being used, so that they can find their jobs rewarding. Further, we hold interviews with all employees on a regular basis to hear their feedback directly, so that top-down and bottom-up approaches coexist as much as possible. We also provide proactive training for the younger generations. The average age of our employees today is 35 - a considerable rejuvenation compared to 55, which was the average age 13 years ago. It is very reassuring to have young colleagues in their mid thirties who play a central role in the company. When looking at them, I am also encouraged to make more efforts so that I can lead everyone as a true leader. In the future, ordinary items that you can obtain or produce anywhere will face more intensified price competition. To survive in the tough textile industry, we would like to produce products that leverage our unique characteristics and strengths to further demonstrate our originality. While taking pride in being a manufacturing company, we would like to continue to dedicate our efforts to creating new things. Imai took up his current position in 2005. 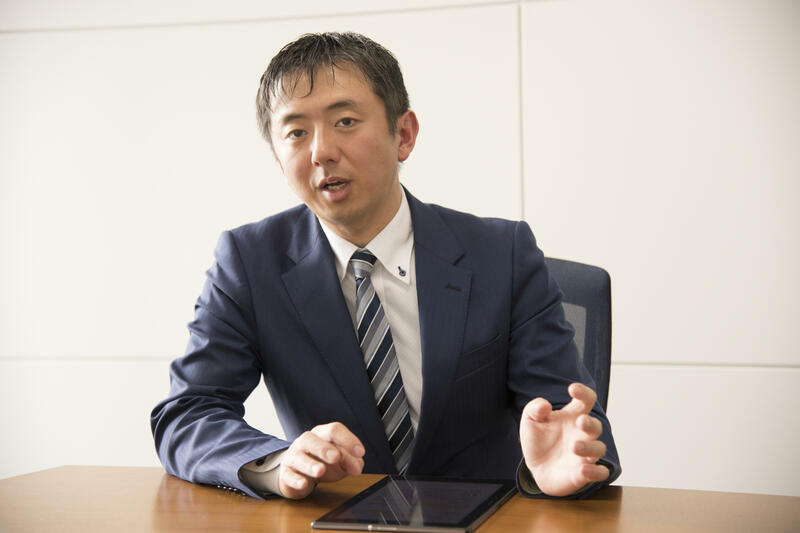 Since then, he has specialized in the development and manufacture of warp knit fabrics while promoting full-scale production and capital investment in the field of sanitary supplies. In 2015, a branding project was launched in commemoration of the 65th anniversary, and a new logo and slogan were established. → IMAI KIGYOJO Co., Ltd.